If you think your life is tough ... listen to these tales! This title, reproduced in digital by the talented team at Oceanhouse Media, was published by Dr. Seuss's in print in 1973. It follows the conversation between a young boy and an old, wise man in the "Desert of Drize". This prophet had only one message for his young listener, namely that life is never as bad as you imagine. In fact, there are so many people experiencing terrible troubles, that it is hard to ever feel bad for yourself. From exceptional traffic jams that tie up a whole city, to bathrooms that are hundreds of steps away from one's home, this Seuss title details some of the most tiresome troubles a person could face. But of course it all done is a most whimsical way with the colorful, detailed and humors illustrations so beloved by Seuss fans. In the end, the advice is clear, "Don't grumble! Don't stew ... (since so many folks are so) ... much more unlucky than you!" Did I Ever Tell You How Lucky You Are? has top-notch features from Oceanhouse Media in app form. Enhancements are primarily educational and focused on word recognition, although lots of interesting sound effects are also connect the images with word meanings for young listeners. Great narration with highlighting word-by-word reinforces the text and if a child taps on any word, they can hear it spoken again. If you tap on an image in the illustrations, the word will appear with accompanying audio. And as a bonus, if that image is present in the text of the story, the word will highlight again, too. 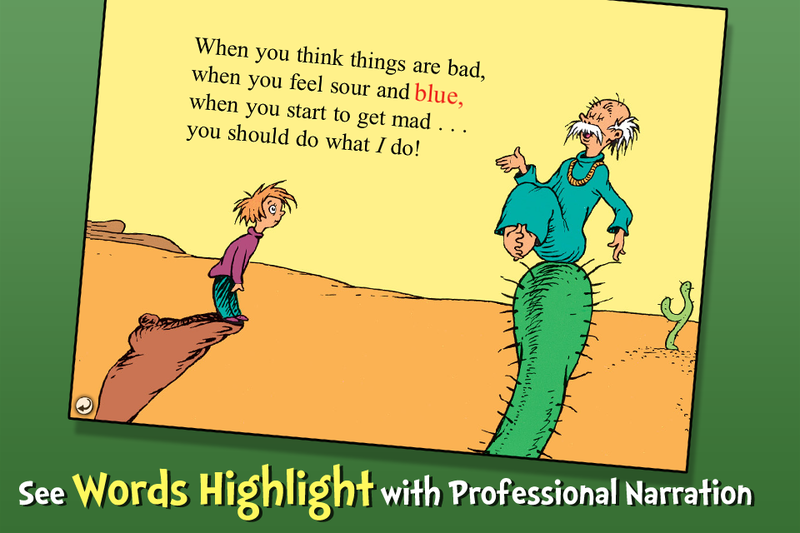 This title has the detailed and colorful illustrations that make Seuss books popular - a treat for any fan. In digital form, most Dr. Seuss OmBooks also aren't animated in any way, but many pages begin by panning over Seuss' classic original artwork, zooming in and out to show off each chunk of text in a nicely paced design. Extra features include the ability to record your own narration as well as excellent navigation with a nice visual 'thumbnail' page guide. Ample settings allow adults to set the book up with or without audio and interactive elements. Overall, this Seuss tale is a delightful read ... it is made even more accessible to a new generation with digital enhancements well-suited for a modern audience. The messages within this story (and most Seuss titles) are subtle, making for rich converstation with young people or even extension activities in a classroom setting. In print and digital, Dr. Seuss is tops with young and old alike, precisely because his books make learning to read (and reading to learn) FUN! Recommended! A young boy spends the afternoon listening to an older, wise-man who shares all the ways he is lucky to not be in the shoes of the many troubled people on the globe. Their stories vary from having impossible jobs (like a boy who must mow quick-growing grass that grows back before he can mow it) to those that are merely unpleasant, like someone who must get up everyday at 6am to fix a broken machine. The message in the end is that most people are much worse off thean yourself, so don't fret.